Over the holidays we went back to my husband’s childhood home, where we tackled the project of cleaning out a few remaining items in his closet. Amid scrapbooks, photo albums, and well-loved toys was a box of trophies. He pulled out two that were special and moved the rest to the trash pile. Our 8-year-old daughter was visibly dismayed. How in the world could he simply throw away all those magnificent trophies?!? There’s a scene in Dead Poet’s Society where Robin Williams brings his class to a trophy case in the hallway. He makes them lean in and listen to what the pictures surrounding the trophies are telling them. In explaining to our daughter why she didn’t need her dad’s old trophies, we spoke to her about thinking bigger than those who had come before her. Yes, the trophies represented accomplishments some 40 years ago, but her dad hadn’t stopped there. He hadn’t brought them with him to sit on a shelf and collect dust. They were simply the start of an extraordinary life. He had continued to seize the day. In 2019, how will we as HR pros think bigger and seize the day? How will we move beyond the accomplishments, recognition, yes, the trophies of the past year, and stretch to be extraordinary in the new year? Performance evaluations, total rewards programs, corporate learning, recruitment marketing, business partnering…these are just a few examples of what HR needs to re-imagine. Take business partnering. It’s not about changing your HR Generalists’ titles to HR Business Partners. Nor is it spending money on consulting from a “design architect” to teach them design thinking. It is about taking a foundational approach and not being afraid to throw the baby out with the bath water. What IF our HRBPs came from Ops or Sales and were groomed? What IF we hired newly minted organizational psychologists who still had an ounce of pragmatism in them and taught them the reality of business? HR Business Partners don’t just need to know how to read financials, they need to come armed with a more holistic approach to their roles. This means HR, Marketing, Sales, Ops, Finance – and yes, even therapy capabilities. Look at who you recruit and develop for HRBP roles in another way. Think about the impact of digitization and resumes. Part of helping your company succeed involves effective workforce planning–which at its basic element is understanding and anticipating the changes in how work gets done. Enter digitization. The business automates a manual process (GOOD) and then doesn’t know what to do with the employees who made up the manual process or how to retool them for another need (BAD). These workers leave and retool on their own–through gigs, apprenticeships, or independent consulting. This leads to gaps in resumes or short tenure at multiple organizations. Most of you know my stance on resumes–and there’s more than one side bet on when they will go the way of inter-office mail envelopes–but this line of thought is unpopular. So is taking a chance on someone who has done a series of interim assignments, or <gasp>, hiring someone who took a year off to learn a new language/skill/care for an aging parent. Trust in your beliefs and move away from the herd. 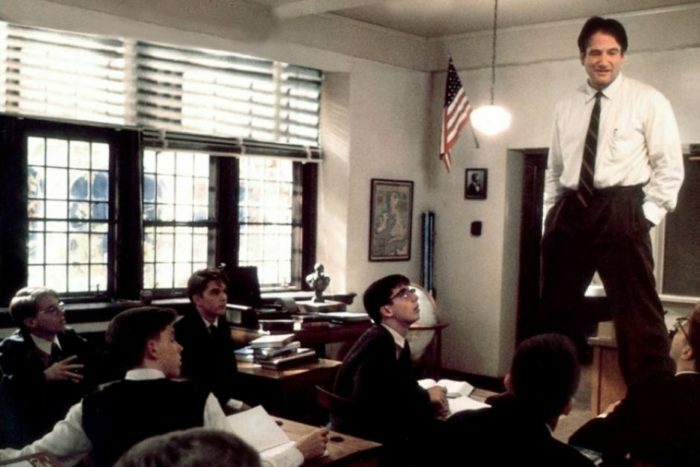 If you haven’t re-watched Dead Poet’s Society in a while, do so. And if anyone knows what to do with my husband’s Kinney’s shoebox full of baseball and Star Wars cards, hit me in the comments!